Exploring cemeteries raises an intersting question - Is a cemetary defined by the people buried in it? Cemeteries can also be interesting places by themselves as well-maintained final resting places, often with interesting statuary, well-manicured landscape and distinctive gravesites. Texas Cemeteries performs both these tasks: It tells the lives of many interesting figures in the context of their gravesites. It also in the course of this describes the aestetic aspects of many of the state's cemeteries. 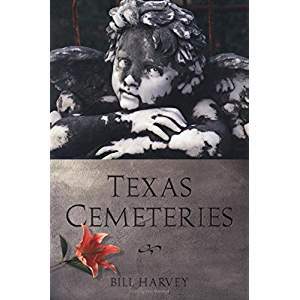 Visiting cemeteries from every era and all regions of the state, Harvey recounts the histories of famous, infamous, and just plain interesting Texans who lie at rest in Texas cemeteries. The book's sub-title, The Resting Places of Famous, Infamous, and Just Plain Interesting Texans because the bulk of the book relates stories of famous figures in Texas history, writers, rock n' roll singers, sports figures, cowboys and cattlemen, military heros, and many more. These epilogues are told in the context of their gravesite. The book is organized alphabetically by city. For each city, Harvey lists one of more cemeteries, giving their location and history, if significant. There is information on the headstones, surrounding monuments, statues and mausoleums. The book also includes numerous photos taken by the author. The book begins with a useful chapter offering tips on visiting cemeteries and locating gravesites. He describes where usefull maps can be acquired, plus other helpful ways of finding elsusive gravesites, which may be an tiny dot amidst thousands of others. Harvey describes the 21st century method of finding a gravesite - via the GPS radio-navigation system. He goes to the trouble of including the GPS coordinates to all the cemeteries listed in the book, which is handy considering many of these locations are out-of-the way and remote. Additionally, many websites on the Internet list the GPS coordinates for specific gravesites, which is extremely handy for quickening a search. Anyone can purchase these helpful, hand-held GPS receivers inexpensively through Amazon.com. After reading through the two dozen pages of introduction, we have learned about an interesting hobby: touring various cemeteries and pinpointing interesting gravesites. Whether you wish to go and see some of these final resting places, or just read up on some interesting Texas stories, Texas Cemeteries performs well. The book's format is well-organized for quick reading. This is one of those books one can just pick up, look through a few pages at random and find something interesting. For example, the book explains that the old Glenwood Cemetary in Houston is one of the city's best-maintained. There are listings of information for Howard R. Hughes, Jr, Oveta Culp Hobby as well as others others buried there. Sparkman-Hillcrest Memorial Park in Dallas is the resting place for sportsmen like Tom Landry (1924-2000) and Mickey Mantle (1931-1995), but also famous political figures like Sen. John Tower, Gov. Pappy O'Daniel, as well as Edith Wilmans, the first woman elected to the Texas Legislature. Famous Texas cattlemen are well represented including Charles Goodnight, Samuel Burk Burnett, John Slaughter and Lee Bivins of Amarillo. Harvey includes many notes on not only sports figures, but also local personalities from University of Texas and Texas A&M. In College Station, we learn about James Earl Rudder (1910-1970), a well known President of Texas A&M, as well as Harry (Rip) Collins (1896-1968), the famous punter from Aggie football. In Austin, Dana X. Bible is interred. Bible was the famous football coach who created the A&M "Twelfth Man" tradition. After coaching at A&M, Bible later coached UT football for many years. Harvey also dedicates significant space to the recently improved Texas State Cemetary, as well as the Acton State Cemetary, the state's smallest state park. Spend time with him in the graveyards of Texas, and you'll soon appreciate what fascinating stories the silent stones can tell. A first impression of Prairie Lea Cemetary was that it should have been named the Cemetary of Angels. Some of Texas' most beautiful angel statuary is to be found in the Prairie Lea Cemetary, particularly in the Tristam family plot. This cemetary is truly beautiful, full of mature oak trees and glorious old magnolias, and is exceptionally well maintained. Am inviting white house stands in the middle of the cemetary, with a number to call if you need to find a gravesite on a weekend. I called and it worked, although I transposed two digits in the phone number and spoke to a woman who was polite if not quite skeptical that anyone could dial the same incorrect number twice. Sections of the cemetary are well marked so if you know the location of a specific gravesite, you should have no trouble finding it. The main entrance to Prairie Lea Cemetary is lined with markers commemorating Texas soldiers who perished in World War I and are buried there. I was struck by the realization that so many of the young American men, who died in a war with Germany were of German descent themselves, an irony repeated in other cemeteries throughout south central Texas. Born in New Mexico, Conrad Hilton (1887-1979) became one of America's premier hoteliers. He served as chairman of the Hilton Hotels Corporation and of Hilton International Company. In all, Hilton eventually owned 188 hotels in 38 U.S. cities and 54 hotels abroad. He left the bulk of his estate, estimated at a half a billion dollars to charity through his Los Angeles-based Conrad N. Hilton Foundation. His headstone in Calvary Hills looks exactly like the polished stone entrance of a Hilton Hotel. You have to love a man who never abandons an effective marketing campaign. Bonnie Parker (1910-1934) was born in Rowena, Texas, and moved to West Dallas as a child. Bonnie was a tiny woman, only four feet ten inches tall and weighing eighty-five pounds, and had been an honor student in school. She met Clyde Barrow in January, 1930 and by 1932 she had joined him in a life of crime. But their crime spree ended abruptly in Louisiana on May 23, 1934. We also review another book profiling Texas personalities in an interesting way: Texas High School Hotshots.